My research focuses on cultural evolution. My work investigates whether there are individual differences – with a focus on personality and social network positions – in the propensity to solve problems through social learning or innovation, in both human children and chimpanzees. Before my PhD, I completed my BSc in Psychology at the University of Plymouth, and my MSc in Cognitive Neuroscience at the University of York. 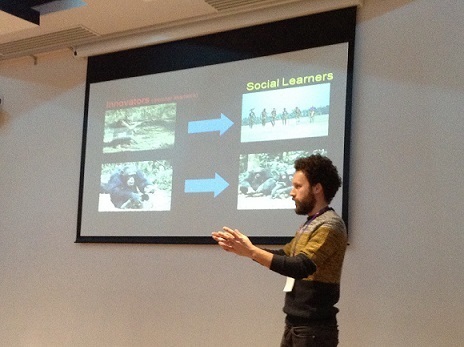 From there, I conducted research work on a range of primate species, but with a particular focus on the evolution of social learning, culture and social network analysis. I have conducted field work investigating social learning in Brazil (capuchins) and Zambia (chimpanzees).